Meet the Brentwood Home mattress! Brentwood Home is an LA based company committed to developing sleep products that are as safe and natural as possible. They have a small line of mattresses that include both foam and spring options designed to meet the needs of a wide variety of sleepers. 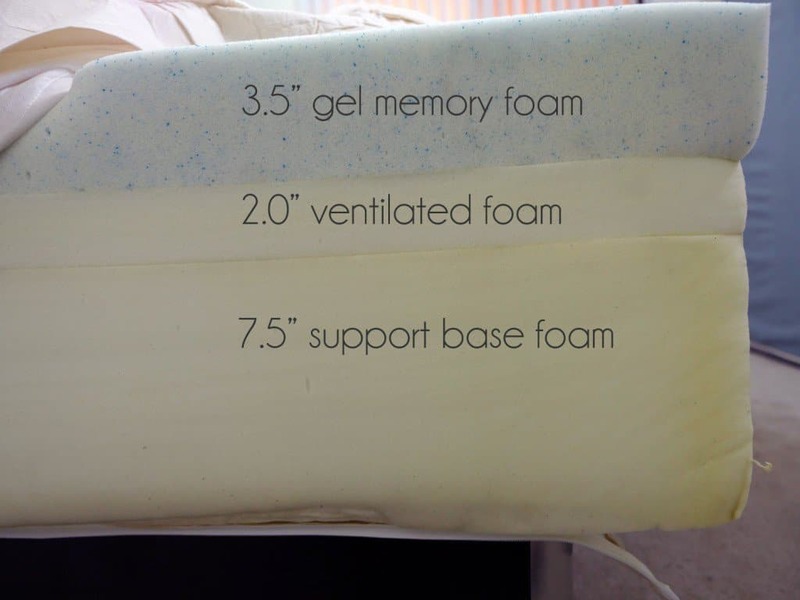 For this review I took a look at their most popular memory foam mattress, their Bamboo Gel 13. While we focused on the Bamboo Gel 13, this mattress is very similar to Brentwood’s other Classic mattresses (Bamboo Gel 13, 11, 10, and 9). For more information on the varying sizes / models see our full comparison of all Brentwood Home mattresses here. The Brentwood Home Bamboo Gel 13 mattress is made in the US and built from a combination of gel memory foam, wool, ventilated support foam, and wrapped in a bamboo infused cover. But does the Brentwood Home bed have what it takes to pass the Sleepopolis mattress test? Continue reading below to find out! The Brentwood Home Bamboo Gel 13 mattress is built from 3 different layers of foam to a total height of 13″. Top layer (comfort and cooling) – this is a 3.5″ layer of gel memory foam. This is the primary comfort layer for the mattress and creates great pressure relief, contouring support, and body shaping. The gel helps to prevent any heat retention in the memory foam and keep the sleeping surface cool. At 3.5″ thick this is a quite thick top comfort layer, especially compared to most other online mattresses. The extra thickness helps to create improved deep compression support and prevent bottoming out, which is especially important for heavier sleepers. Middle layer (support and cooling) – this is a 2″ layer of ventilated support foam. It works in connection with the gel memory foam top layer to continue to improve airflow and cooling in the mattress. It also acts as a transitional support layer, further preventing any bottoming out feeling in the mattress. Bottom layer (foundational) – this is a 7.5″ high density support foam. This layers acts as the foundation base and provides shape and stability for the mattress. The cover of the Brentwood Home mattress is built from a blend of polyester and bamboo. It’s designed to help keep the sleeping surface cool and deliver a soft feel to sleepers. The cover also has a wool layer backing sourced from New Zealand. This thin layer of wool helps to naturally wick moisture away, improve airflow, and help prevent odors. The layer of wool is a bit of a rarity in the online mattress industry. Most online mattress companies utilize ultra thin covers design to help sleepers feel more direct foam contact. The layer of wool gives the mattress a slight cushioned traditional feel. In terms of the style and aesthetics, the cover is fairly simple and straight forward. It’s all white with a basic horizontal stripping across the top layer of fabric. 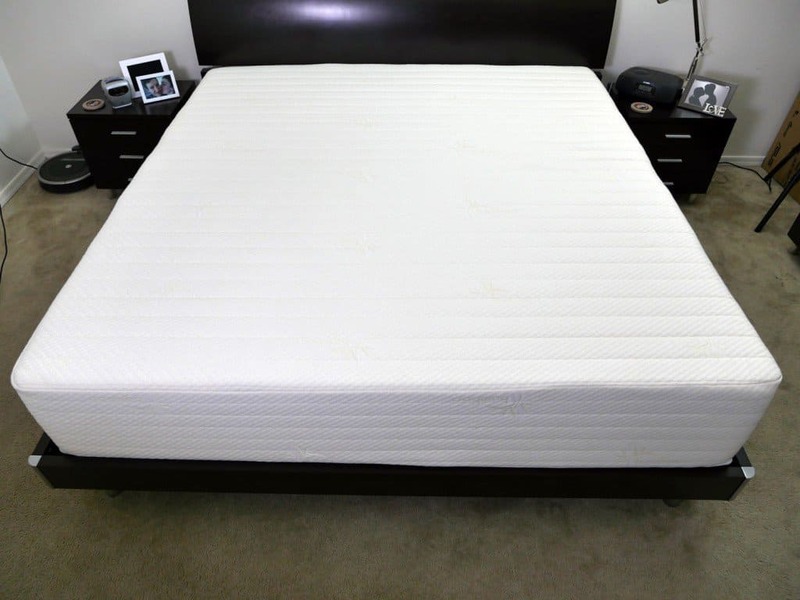 At 13″ thick the Brentwood Home mattress is thicker than most mattresses (10″ is the most common size). This extra thickness gives the mattress a little more “weight” and prominent feel within the room. There is a zipper on the bottom of the cover. This allows the cover to be removed, which can be helpful in the event you need to spot clean the mattress (spot cleaning only, don’t machine wash / dry the mattress). 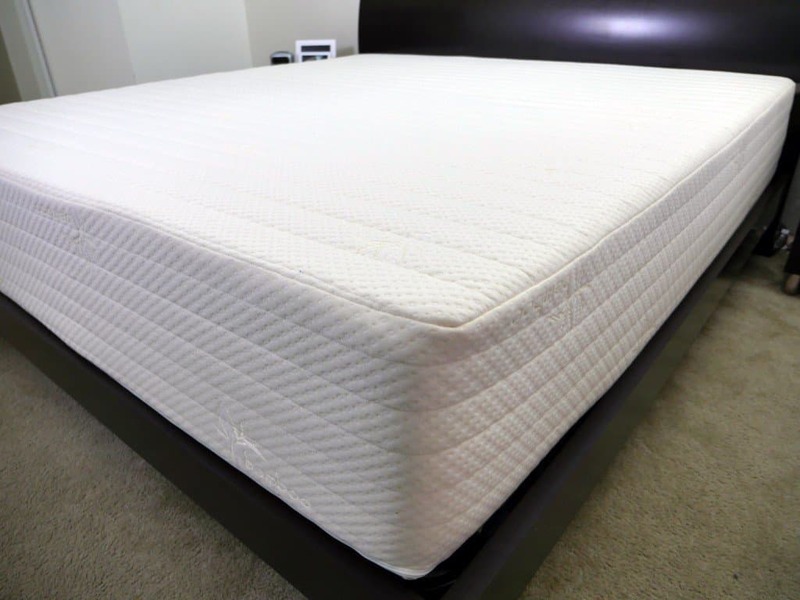 The Brentwood Home Bamboo Gel 13 mattress comes in at a 5-6 out of 10 on the firmness scale. It has a medium feel that will meet the needs of most sleepers. FAQ: What firmness do I need? If I had to sum up the Brentwood mattress I would say it has a traditional memory foam feel with advanced cooling features. Perhaps the most common complain sleepers have with memory foam is the effect that the deeper hug and contour has on heat retention, causing sleepers to heat up during the night. The Brentwood Home mattress also has this classic memory foam feel. However, it does an excellent job of improving airflow, keeping sleepers cool. The response time is average compared to most other memory foam mattresses. After you first lie on the mattress it will take a few seconds for the mattress to adjust to your size and shape. The mattress has excellent body shaping and contouring. The top layer of foam allows sleepers to sink 1-2″ (more if you are a larger person) creating a notable hug. However, even with this level of hug the mattress does a good job of staying cool during the night. The combination of bamboo infused cover, wool backing, gel memory foam, and ventilated transition foams work together to promote airflow and cooling. I did not feel excessively warm during my sleep test of the Brentwood Home mattress. Sleepers who are very sensitive to heat may find the mattress warmer than they like by virtue of having more of your body’s surface in contact with the mattress via the deeper hug (these sleepers may find one of Brentwood’s latex or coil mattresses a better fit). I found the mattress offered excellent support. The thicker overall profile and thicker comfort layers do a great job of providing support even with the increased level of sinkage and hug. Sleeping near the edge wasn’t incredible, as the deeper level of sinkage just don’t allow the edges to properly support sleepers. However, this is not unexpected. Most memory foam mattresses, especially those with deeper body shaping struggle with edge support. Sinkage and mattress hug are incredibly important. The sinkage in various positions and places on the mattress can dramatically change the feel and overall experience. Every mattress reviewed on Sleepopolis goes through the same sinkage tests. I created these tests to help better explain the subtle differences between each mattress hug, contour, and sinkage. As a reference point, I am 6’1″ and weigh 140 pounds. Your sinkage will vary based on your weight, size, and body shape. Brentwood also offers a wide variety of additional sizes including: Full XL, Olympic Queen, Split Queen, Split King, Split Cal King, RV / Short Twin, RV / Short Full, RV / Short Queen, and RV / Short King. Great option if you have a tough mattress size you’re trying to find. Is the Brentwood Home mattress right for you? Want a traditional memory foam hug – the Brentwood Home mattress has a notable level of sinkage in the 1-2″ range, slightly more for heavier sleepers. This gives the mattress noted hug and body shaping. However, it also gives the mattress a more traditional slower response time. It takes the mattress a few seconds to adjust to changes in movement. Sleepers who need instantaneous foam response will probably not like the feel. Want a medium firm feel – the Bamboo Gel 13 mattress has a medium firmness in the 5-6 out of 10 range (where 10 is the most firm). It has a traditional feel with a firmness designed to meet the needs of the majority of sleepers. 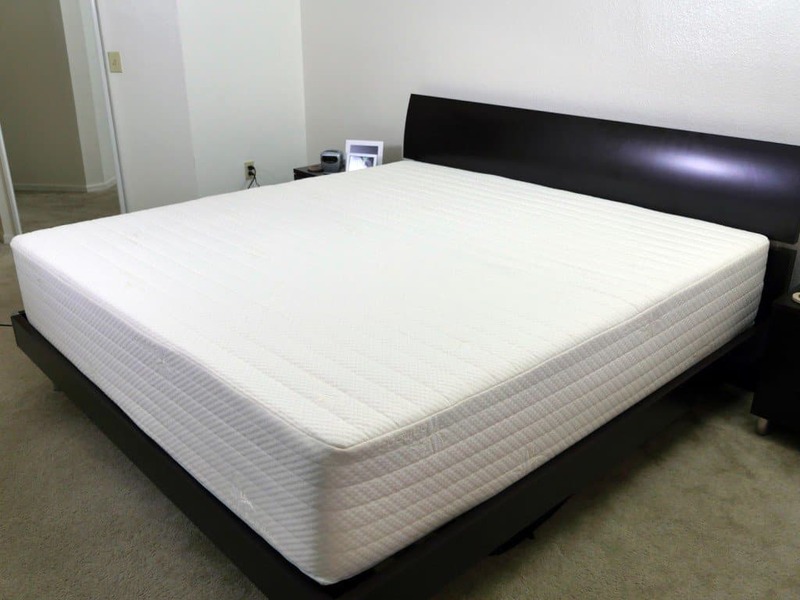 Want improved cooling + memory hug – for sleepers who are looking for the classic memory foam hug, but don’t want to be hot, the Brentwood Home mattress hits a nice balance. The combination of bamboo infused cover, wool backing, ventilated foam, and gel memory foam work together to keep the mattress cooler even considering the deeper memory foam hug. However, for heavy sleepers or other sleepers who sleep very warm, you may find the nature of the increased hug to be too warm. These sleepers should consider Brentwood’s latex or coil mattress options. Want great deep compression support – the 5.5″ of comfort foam + 13″ total profile gives this mattress excellent deep compression support. 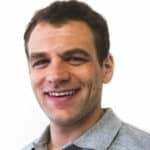 This is especially important for sleepers who want a deeper hug, but are afraid of bottoming out the mattress, or for sleepers who are a bit on the heavier side. For more information the Brentwood Home mattress visit BrentwoodHome.com. The Brentwood Home Bamboo Gel 13 mattress provides a traditional memory foam feel, while incorporating advanced cooling features for a delightful comfort. The combination of gel memory foam, wool backing, ventilated support foam, and bamboo infused cover work together to create great cooling on the sleeping surface of the mattress. Support is consistent across the base of this mattress, rounding out an excellent overall value of materials, build, and service quality.